I teach mindful movement inspired by over two decades of practicing the teachings of BKS Iyengar. For me, yoga is the attempt to find deep presence in moment-to-moment breath, movement and thought. In my teaching, I encourage students to connect to their understanding of their body and to explore a broad range of yoga postures in a creative way. My yoga journey began 30 years ago in 1985 when I first travelled to the Himalayas. At the time I was living in Banff and working seasonally as a back country cook for Parks Canada and various hiking and ski lodges. For years, I had a schedule that allowed me to travel extensively in Tibet, Nepal and India. I was able to trek, practice and study there to my hearts content. The vastness of the land, the depth of the teachings and the connections I made affected me on a profound level and are the backdrop to my life. During this time in the 80’s I started practicing yoga and meditation. In 1987, I studied in Dharamsala with HH the Dalai Lama and continued to attend many teachings elsewhere with other teachers. In the mid 90’s I settled in Toronto and began practicing Iyengar Yoga, and soon embarked on the three year teacher training program with Marlene Mahwhinney. 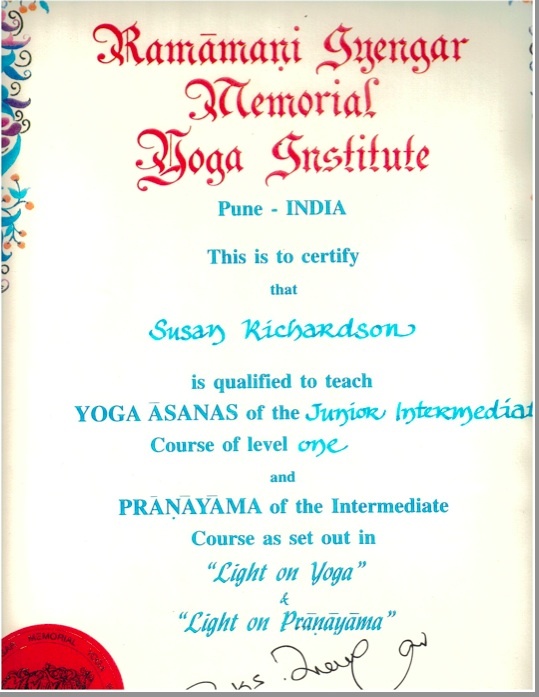 I am certified at the Intermediate Level and continue to study with many senior Iyengar teachers. I have been blessed to attend two intensives with Geeta Iyengar and to study with the Iyengar family in Pune, India for a month in January 2015. Over more than two decades, I have accrued thousands of hours of teacher training, and have taught at many Toronto studios, festivals and in teacher training programs. I strive to integrate the most modern understandings of therapeutic alignment, breath and movement to help my students feel more at home in their bodies. Alongside my yoga studies I have studied the Zoologic System of Kinesthetic Anatomy in Clay with Laura Allard, and done hoards of anatomy study with the work of Tom Myers and Doug Keller. In the 80’s I studied Tibetan at University of Calgary, and later delved into Sanskrit for years with Manorama. I am certified member of Yoga Alliance at the highest level, E-RYT 500 and have taught experiential anatomy in six different year long teacher training programs. I love this Susan. Thank you for the beauty of your thoughts and delvings,and painterly photographs. I envy and mainly admire and deeply respect your depths of courage and your abilities to express yourself so intelligently, gently and openly in print and in music and through your body to the soul in yoga.